SOLD IN 2 DAYS FOR OVER THE LIST PRICE! 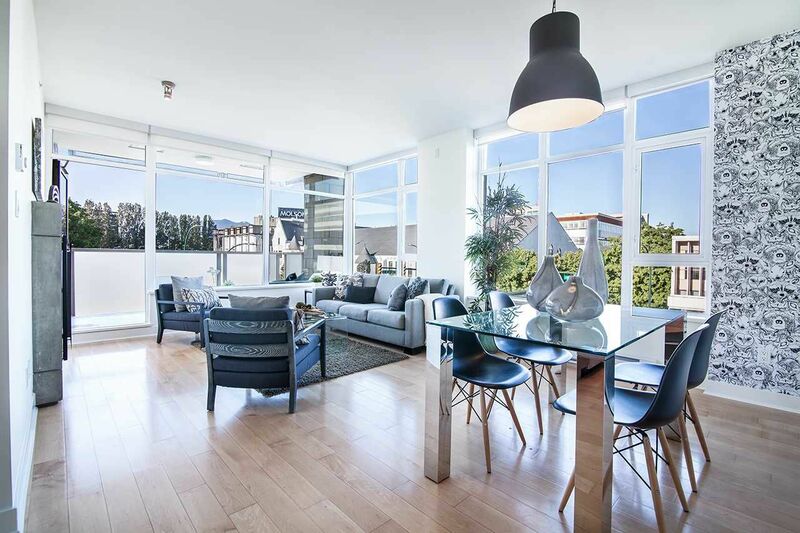 Oozing w/modern style, clean lines & a light airy flow, this immac & bright 2BR+Flex/2 Bath Corner Unit @ FIRST ON FIRST (a very well-cared-for boutique modern CONCRETE building), offers so much in this perfect Kitsilano location. Large covered patio & great interior layout w/9' ceils, engineered hrdwd flrs, functional spacious designer Italian kitchen by Dada, Fisher&Paykel and Bosch stainless appl's w/gas range & quartz counters, expansive living/dining rm w/fireplace & wraparound windows showcasing views of Seaforth Park, Class A-Heritage Seaforth Armoury & N.Shore Mountains. All this and easy walking to Kits Beach, Granville Island & Downtown. 1 Parking + 1 Locker. Pets/Rentals OK. OPEN HOUSES CANCELLED. SORRY FOR THE INCONVENIENCE.